Seafarers’ Rights International (SRI) and the International Transport Workers’ Federation (ITF) are backing a new book on the plight of fishers that is due for publication tomorrow, Thursday 30 July. 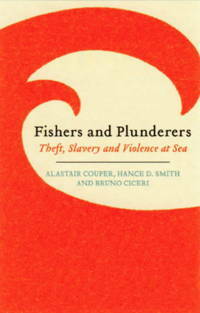 Fishers and Plunderers; Theft, Slavery and Violence at Sea, published by Pluto Press, explores the dark side of the global fishing industry – including exploitation, child labour, murder and human trafficking. It has been written with the active cooperation of the ITF and SRI. Fishers throughout the world pay the price for the economic and environmental pressures faced by today’s fishing industry. Greater competition and deregulation, including the use of flags of convenience, are squeezing fishers’ wages and conditions. Overcapacity of fishing fleets and destructive fishing practices are depleting fish stocks, in turn increasing economic pressures on the industry. The fishing profession is the most dangerous in the world, and contrary to other sectors it is becoming more hazardous. In the United Kingdom, for example, the fatal accident rate for the fishing industry was 115 times higher than that of the overall workforce in 1996-2005. In deep-sea fishing, isolation, insecurity, accidents and violence are commonplace, especially involving migrant fishers from developing countries. More and more cases of human trafficking are coming to light, with poor people becoming slaves on fishing vessels. Small fishing communities, especially in developing countries, are suffering due to the proliferation of large commercial fishing companies and illegal fishing. Desperation arising from abhorrent conditions aboard fishing vessels has led to mutinies and even murder. Fishing vessels are used for criminal activities, including the drugs trade. They have also been taken over by pirates to launch attacks. The plight of fishers, as well as the lawlessness at sea, point to the urgent need for a strengthened international legal and regulatory framework that is well enforced. For more details of ILO Convention 188 please see http://goo.gl/UoZYM9 . It is also covered in chapter 14 of the book.